Super Mario Galaxy is a 3D platform game developed and published by Nintendo for the Wii. It is the third 3D platformer in the Mario series, after Super Mario 64 and Super Mario Sunshine. 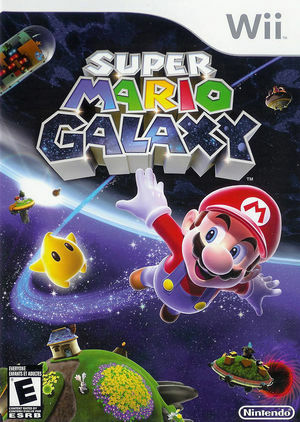 A sequel, Super Mario Galaxy 2, was released in 2010. The game follows the protagonist, Mario, on a quest to rescue Princess Peach from the game's primary antagonist, Bowser. Levels are galaxies filled with minor planets and worlds, while gameplay is updated with gravity effects and new power-ups. 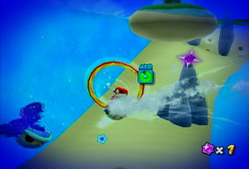 Super Mario Galaxy was first shown at E3 2006 and enjoyed a high level of pre-release awareness. The game has been hailed by several gaming websites as one of the best video games of all time. The Wii language setting must match an acceptable language for the region of this title being played: Japanese for JP; Korean for KO; English, Spanish or French for NA; English, French, German, Italian, or Spanish for EU; and Traditional Chinese for CH. Due to region checking built into the game, if an unacceptable language is set emulation hangs. Certain materials that reflect Mario have inverted reflections, refer issue 3106. This issue actually also exists on real hardware, so it's not an emulator bug. Wii Remote slows down when collecting starbits. 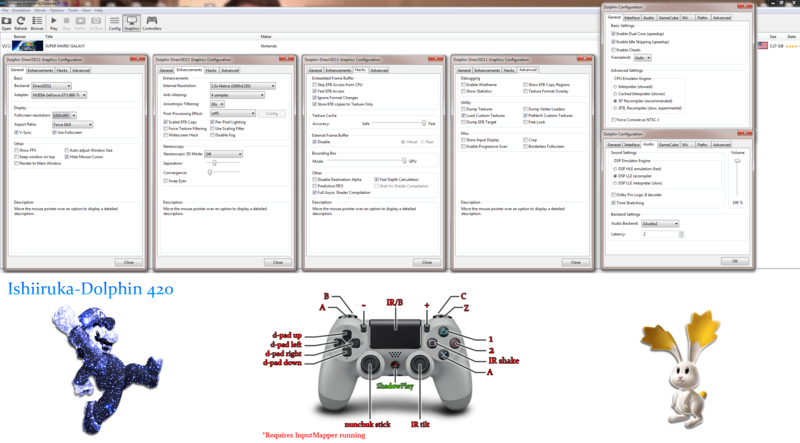 To remedy this, go to Dolphin Controller Configuration Window and disable (untick) Enable Speaker Data and this will mute the Wii Remote speaker, fixing the starbit slowdown problem. Seems like it might have something to do with the computer's Bluetooth dongle not granting enough bandwidth for the Wii Remote to receive the sounds and transmit controls at the same time. It's a problem bound to PC hardware and driver, you can also try Bluetooth Passthrough. Viewing the sun will cause serious performance hits due to the way EFB is used. 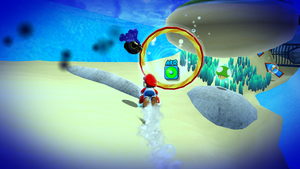 In Underwater Cosmic Mario/Luigi Race of Sea Slide Galaxy, the shell that Cosmic Mario/Luigi holds will have messed-up textures. See issue 9113. To fix, uncheck "Store EFB Copies to Texture Only". In the overview of galaxies and elsewhere Bloom effects are applied, which are not displayed correctly at high resolutions. To fix the problem, deselect Scaled EFB Copy. 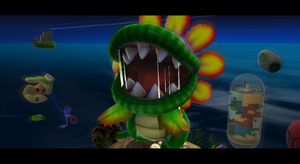 As a result, some parts of the game are only displayed in standard resolution. When shooting a photo in the Star Chart, "Store XFB Copys to Texture only" must be disabled to allow the photo to be saved correctly and displayed on the Wii Pinboard. Boss roar effects are not visible. See issue 8327. Project was almost complete but now seems to be abandoned. The graph below charts the compatibility with Super Mario Galaxy since Dolphin's 2.0 release, listing revisions only where a compatibility change occurred. 3.0-799 Windows XP Intel Core 2 Duo E8400 @ 3GHz NVIDIA GeForce 7300 LE 35-20FPS Average. Seriously horrible slowdown issues, And Dolphin was actually on the verge of crashing one time when slowdown became really bad at the Beach Bowl Galaxy, Because my GPU got desynced. This page was last edited on 8 June 2018, at 22:04.